Ethiopia's Renaissance Dam and the diversion of the Blue Nile is a declaration of war on Egypt, Sheikh Abdel-Akher Hammad of Al-Gamaa Al-Islamiya said on Wednesday. On Tuesday, Ethiopia began diverting the course of the Blue Nile, one of the Nile River’s two major tributaries, as part of its project to build a dam for electricity production. Speaking on Al-Arabiya satellite channel, Hammad claimed the move would reduce Egypt's water supply and damage national security. "If such a war is forged against us, we are ready to fight and we will embark on it with all our strength to defend our honour," asserted Hammad. Diplomatic negotiations should be the first step, he added. Hammad went on to say the crisis should have been dealt with by the Mubarak regime. The Blue Nile provides Egypt with the lion's share of its annual 55 billion cubic metres of river water. We Ethiopian never go back! 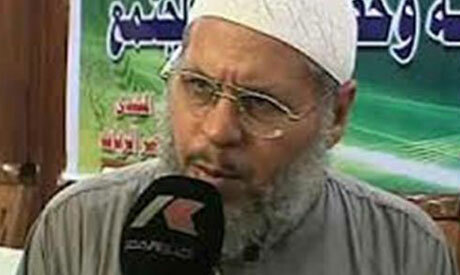 Once again I want tell you the truth to the Mursi government and Abdel-Akher Hammad. we Ethiopian more sensative than Egyptian about the Nile. We don`t believe in warfare. We have a culture of diplomace. If some thing happen in our national security millions of Ethiopian ready to die. here in Ethiopia there is no orange revolution!!!! we have our own culture which is quit different from any Country about the great name ---Ethiopia. Egypt should search for further and alternative rather creating crisis on its own country Not only Dam ,due to natural climate changes nile possibly dry. WAR ? may I ask how ?? In Ethiopia religion and state is different.We moslims Ethiopian love our country very much and reedy to die for our mother land.Ethiopia is first. We fight the terrorist AL-shabab and similar groups.Goodby salafist Lee. Egypt will not allow any meddling in its historical rights to a certain share of Nile water. The only way is love, care and share! Ethiopia has the historical right to use it water resources. And Ethiopians are only demanding to share the water with their brothers (Egyptians and Sudanse). There is no recognition of "historic rights" in a court of law. This so-called historic right was at the expense of Ethiopia who was not consulted. So your "historic rights" don't mean a hill of beans especially when you are a downstream country. The only right you have to the Nile is that part within your borders, unless Ethiopia tries to block or divert the Nile in another direction... as comically ridiculous as that notion is. If you really want to know the truth and stop panting so hard for war, Ethiopia's dam will not diminish Egypt's water and it's never been the intention. The diversion taking place now is to move water around the construction site, but from there it continues on the same course. Think about what you are suggesting... or believing. Is Ethiopia blocking the entire river? Is she carving out an entirely new course so it will flow to... say... Eritrea or Djibouti? This conspiracy theory sounds like something from a wild sci-fi novel. It's implausible. Please don't try to scare us! Because we wont fear your bunch of words! America is a supper power still they pay for Canadians water(specifically for Colombia river). South Africa is a big country, she still pays for Lesotho's water. Egypt intention to use the Nile water in the expense of Africans shows their absolute ignorance and selfishness. The solution is win win situations: we pay for their oil and they need to do the same for our water; and no more interfering in African politics. @Habesha Do Ethiopian Muslim extremists dominate the government? Is there a Muslim Brotherhood or Salafist government in Ethiopia? NO! So there is a difference. 40 million Muslims or not, they are still not the majority - obviously most of them are not Islamists if they support the dam project overseen by the government. Any kind of government and/or country that is secular and has deep in its history Christianity is deemed as unacceptable to Islam. The radicals running Egypt are no different. I hope that clears things up for you. Well, you may wish to go to war. But going to war won’t change the source of Nile. would it? The source of the Blue Nile would remain Ethiopia and it will be up to you the Egyptians to decide if it is in your interest to attach a country that will remain up-stream for ever. This is what I suspected the Islamists have wanted all along. They actually think that Ethiopia using her own water is a dishonor to Egypt. In other words, Ethiopia is supposed to be subservient to Egypt - a mostly Christian country must be subservient to them in their worldview. Egypt's water is not being taken away. If Hammad would actually read something other than the Quran than he would know that. Still, I think there is a religious agenda behind this. He and other like him want Ethiopia to become an emirate. Because Ethiopia doesn't want to pay Jizyah, then accord to Hammad, they made be attacked until they submit (or convert to Islam of course). I hope everyone with common sense in this world reads this article. Habesha, I didn't say all Egyptians are Islamists did I? I know there are Coptic Egyptians as well. I'm talking about the Islamist regime calling itself the Freedom and Justice Party. You can try to deflect all you want, but there are Islamist who do view this in a religious manner. Your comment about there being Muslims in Ethiopia is irrelevant to my point, because Ethiopia is predominately Christian, is it not? Not once did I mention all Egyptians nor did I say all of them were Muslims. You clearly only picked out parts of my statement you wanted to respond to and leave out others. this is about affair of country not religious..don't be ignorant!! don't associate with religion,Egypt and Ethiopian conflict will never be religious conflict. Half of the population of Ethiopia are Muslims, about 40 millions muslims, we care about our Ethiopian country.